Schulich Medicine & Dentistry today welcomed 56 first year dental students in the Class of 2016, as well as 20 International Trained Dentists in the Class of 2014 with a White Coat Ceremony at Talbot College. The class of 2016 is made up of 28 male and 28 female students, chosen from 507 applicants. The class average based on the best two years at university is 88.9%, and the average age is 24. Fifty of the 56 students are from Ontario. They were officially welcomed to Schulich Dentistry by Dr. Tom Mara, the Chair of Admissions; Dr. Michael Strong, Dean; Dr. Harinder Sandhu, Director and Vice-Dean, Schulich Dentistry; Dr. Arthur worth, President, Ontario Dental Association; Dr. Jack McLister, American college of Dentists; Dr. Ted Clement, London District Dental Society; and David D'Silva, President, Western University Dental Student Society. 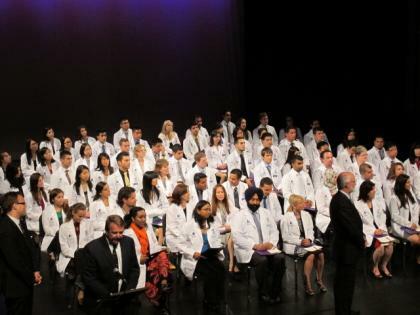 After receiving their white coats, the students recited the Oath of Commitment, led by Dr. Peter Trainor, the President of the Royal College of Dental Surgeons of Ontario. A reception and tours of the dental clinic followed the ceremony.